The compact Accent remains popular with people who are interested in fuel economy without sacrificing comfort. The interior is simple yet functional. See the new models at Hyundai Inland Empire. Get behind the wheel and go for a test drive. The two-toned cloth seats are contoured to surround your body in comfort whether driving across town or across the country. The dashboard, door panels have matching two-tone style. 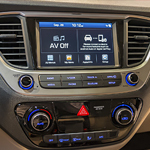 The centrally-located infotainment system has easy to use buttons to select function. Link the system with a smartphone to listen to your favorite playlists. The instrument panel features a tachometer, speedometer and gas gauge. A digital readout displays the battery charge, the outdoor temperature, miles remaining on the fuel tank and current speed. A trip mile readout lets you know how far you have traveled during your planned journey. See all of the available amenities on the Hyundai Accent at your local Hyundai dealership.